First of all, let me apologize my lack of posts recently. My MacBook started to act really weirdly, which made it very hard for me to work and to blog, and I spent hours trying to fix things until I realized that my hard drive was about to die. Hence more time spent in HD hunting (not my usual kind of shopping), playing with screwdrivers, but mostly reinstalling everything which takes hours and hours. After this whole debacle, I feel it'a s a bit too late to talk about my June favorites, so I'd rather jump into reviewing something new I've started using. For the record, I am a very pale creature, nevertheless I have cool olive undertones which give my pale yellow skin a green tinge. That means I would rather not have to expose my bare legs. Heck, I'd rather not see them myself. For years I've spent time exfoliating and fake-tanning my skin, but as years go by I find I can't be bored anymore. And this year it's been even worse because we have had so few sunny days that going through the whole routine for just one day of going out bare-skinned. Enters this new product, released in May, bought in June and pretty much useless until now: Caudalie Jambes Divine. This is a bronzing fluid that will make you look like you are fake tanned yet will go away with soap next time you will shower. Perfect when you wake up and see it's sunny and want to wear a skirt, much easier than planning in advance and going through the whole fake tanning process. The product comes in a glass bottle in a pump. You will need a couple of pumps to do a half-leg. It smells a little bit sweet but I have found that you don't smell it at all anymore after a few minutes so nobody is going to ask what your perfume is. It sets in a few minutes too, so you won't have to walk around the house without being able to sit down for 15 minutes and you won't feel sticky. Once it sets, it feels like a lightweight moisturizer. The result: bronzed legs. The color is not orange at all, it is even a little bit yellow for my taste (I usually go for the more olive fake tans) but it is nevertheless very natural and really does the trick. Is it foolproof, then? Well, yes and no. You can actually build up the intensity by using more product, which means that if you don't apply as much on both legs, you'll have a tan that doesn't match on both sides. For this reason I recommend applying in daylight and not in a dark bathroom. You can apply with your hands but be careful to blend well, especially around the ankles and feet, or you will end up with stains like you would with badly applied fake tanned. I have not yet tried to use a mitt but I suppose that might help. Does it last well? Again, yes and no. If, like me, you are crossing your legs a lot when sitting, and particularly on one side, you will notice after a little while that there is a white patch on the knee where your leg was resting. Probably even more so if it's really hot and you are sweating but I did experience the problem under circumstances that were not that extreme. The verdict: this is a good product, that I will definitely continue to use. As it's light and natural, you can also use it easily on your arms and chest, it's a perfect all-rounder. You need to be a bit careful when applying, though. 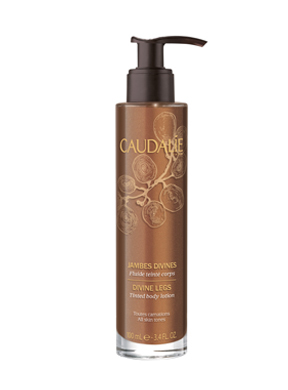 Caudalie Divine Legs is 100ml and costs €28. It is made of 92% of natural ingredients. Aww so sorry to hear about your hard drive! Glad to year it's fixed though! I have this on my arms/legs as we speak! I've never really noticed any problems with it, but maybe I don't use enough? I use half a pump or so per calf. I've tried to do two thin layers, but that's when I noticed it balling up a little, so I've been sticking to one thin layer. I'm a fan, but I've never used anything else that is remotely similar before, so I might not be the best judge here! Caudalie has such great products~ Have you tried any others? I've just opened up an online French skincare boutique where I stock Caudalie as well as many other cult favorites.